6) Fried Wontons – Yak & Yeti Restaurant – Another popular full service dining location in Disney’s Animal Kingdom can be found in the Asia section of the park. Yak & Yeti Restaurant is open daily for lunch and dinner and serves up pan-Asian cuisine with a wonderful backstory. The restaurant is said to have been founded by a family who traveled throughout Southeast Asia collecting artifacts, artwork, and recipes along the way. After returning home they started the restaurant where they could share all they have collected, and guests can enjoy the cuisine on two floors filled with beautiful pieces of art. While menu items such as Ahi Tuna Nachos, Lo Mein Chicken, Coconut Shrimp, Korean Beef, and Sweet and Sour Chicken are delicious, there is one dessert option that is a guest favorite at the Yak & Yeti Restaurant. 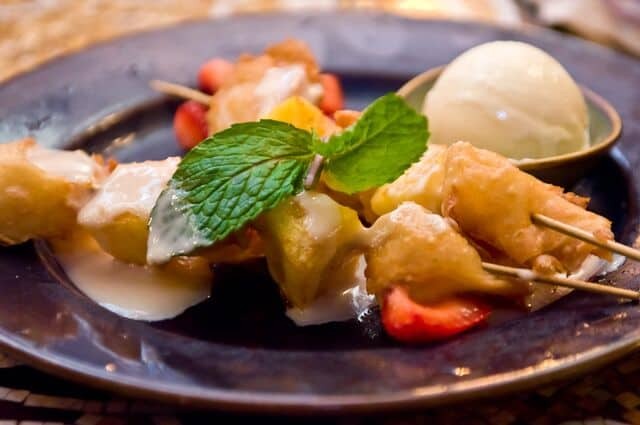 The Fried Wontons feature skewers of fresh pineapple and fried wontons stuffed with cream cheese accompanied by vanilla ice cream and a honey-vanilla drizzle. Guests are sure to love the unique, sweet, and tart end to their wonderful meal at Yak & Yeti Restaurant.